Netsparker Enterprise integrates with FogBugz (Manuscript) to enable vulnerabilities that are automatically identified during a Netsparker web application security scan to be automatically created as cases in Manuscript. Netsparker Enterprise has out of box support for resolving and reactivating FogBugz (Manuscript) cases according to the scan results, in addition to automatic case creation. Netsparker Enterprise uses default resolved and reactivated statuses in FogBugz (Manuscript) for this purpose. 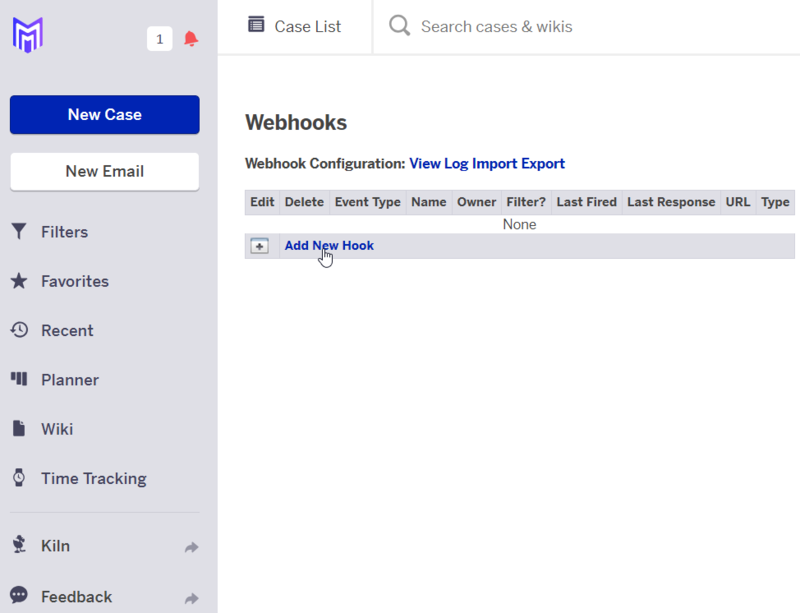 To enhance issue synchronization support, Netsparker Enterprise also offers webhook support. This enables you to detect any status changes FogBugz (Manuscript) cases opened by Netsparker Enterprise. Netsparker Enterprises generates a Webhook URL after you save your integration settings. When you register this link as a webhook in your FogBugz (Manuscript) Project, you will complete Netsparker Enterprise issue synchronization for your integration. When you resolve your FogBugz (Manuscript) case, your Netsparker Enterprise issue is automatically marked as Fixed (Unconfirmed) and a retest scan is started. And, when you reactivate your FogBugz (Manuscript) case, we can Netsparker Enterprise issue is automatically marked as Revived. 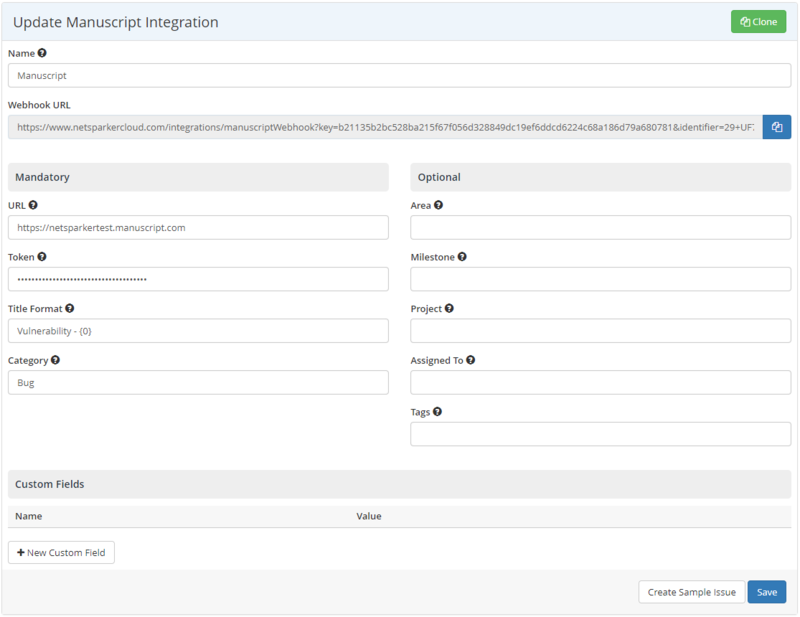 From the main menu, click Integrations, then Manage Integrations, and next to the relevant JIRA integration, click Edit. The Update Manuscript Integration window is displayed. In the Webhook URL field, click Copy to clipboard ( ). In FogBugz (Manuscript), in the Webhooks window, click Add New Hook. Paste in the Webhook URL (from Step 1). 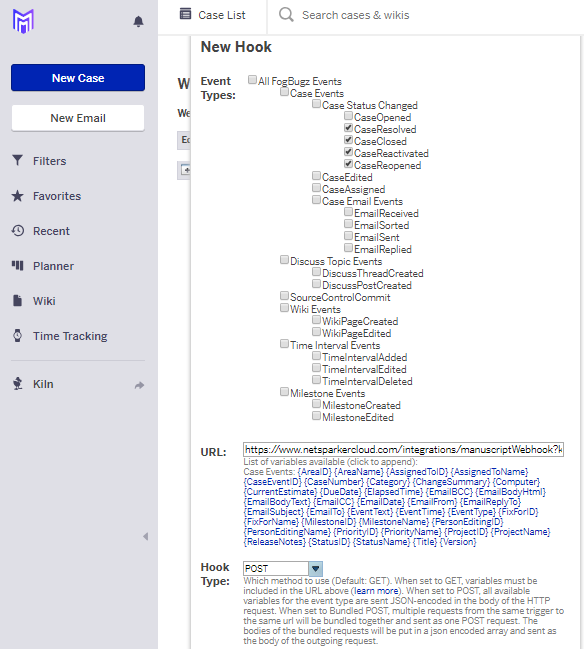 Add a filter, select the CaseResolved, CaseClosed, CaseReactivated and CaseReactivated Event Types and from the Hook Type dropdown, select POST.